And with that brief, impassioned speech, “The Zygon Invasion” arguably became the most important Doctor Who episode since “Vincent and the Doctor” tackled depression back in 2010. Doctor Who has a history of addressing real-world social and political issues through its fantastical lens, most notably back in the Barry Letts–produced Jon Pertwee era, which was famous for it. Indeed, one of my major gripes with the modern incarnation of the series is that it doesn’t do it often enough. It is the job of science fiction to show us the better part of ourselves, often by showcasing the downright ugly. If it wasn’t previously obvious that this story is a metaphor for the world’s dealings with certain factions operating out of the Middle East, then that speech from the Doctor sealed it. The story is a sequel to the 50th anniversary special, “The Day of the Doctor,” which closed with UNIT and the Zygons negotiating a peace treaty that led to 20 million Zygons covertly living among humanity. The treaty has since broken down, and a disgruntled element that had nothing to do with the treaty is mounting a revolution. “Truth or consequences” is their ongoing refrain — these Zygons no longer wish to live in the shadows of mankind, and if mankind won’t accept them, then they’re willing to commit genocide. The return of Osgood (Ingrid Oliver), after being vaporized by Missy in last season’s finale, is deftly handled. Many guessed the Osgood here would be her Zygon duplicate introduced in “Day” back in 2013. Well, yes and no, and the subtle high-wire act Harness plays on this issue becomes central to the story. This Osgood might be the original and she might be the Zygon duplicate, and in her own view, neither is any more or less a person than the other. Osgood is squarely at the heart of this story’s mission statement; she is both human and Zygon simultaneously. The Osgood duo became the living embodiments of the peace treaty after it was brokered, and one gets the feeling that after half of the duo died, so did the treaty. The death of Osgood last season was such a defining moment for Missy’s character (as well as gut-wrenchingly pivotal for viewers), that I had grave doubts the series could pull off a satisfying return, and yet not only has it resurrected her, but also made her central to the goings-on. Cheers, Harness. You did great on this issue. Briefly seen at the start of the season, UNIT and Kate Stewart (Jemma Redgrave) make proper returns here, in a story that echoes one of the defining Doctor Who UNIT tales, “Doctor Who and the Silurians.” But it must be said, Kate is sharper and more in tune with the complexities of the changing world than her father (in typing that, I just remembered that the Brigadier was last seen as a Cyberman!?) ever was. It is not her first reaction to attack, but rather to lead and investigate, and she smartly recognizes that the root of the Zygon menace is in the youth movement. The fact that I’ve gone this far and said little about the Doctor and/or Clara is a testament to how well the episode’s numerous elements work. Early on, in peace-broker mode, the Doctor attempts to reach out to a pair of Zygon leaders. Now, most people who’d see an older man in sunglasses chasing two little blond girls around a playground might get the wrong idea, and the scene was some clever misdirection. Surely he’s all wrong, much like he was about the rabbit in the woods back in “Day”? Nope. He’s got this. It sets us up to believe that the Doctor’s in batty or confused mode, when in fact he’s anything but; it’s a potential gag the material doesn’t deliver on. In that moment, the episode goes serious when it was least expected, and the laughs are few and far between in “The Zygon Invasion,” which is one of its strengths. Those of you familiar with my Who writings over the years might recall that I’m not a fan of doppelgänger sci-fi stories, and the Zygon shenanigans of “The Day of the Doctor” were its least successful element. I wasn’t looking especially forward to this story, and was fully expecting a couple episodes of “Who’s the real one?” nonsense. It was so refreshing to discover that the Zygon concept shifted into serious, horrific Body Snatcher mode. The episode’s greatest triumph in this area is what was done with Clara, which is shocking on the first viewing and masterful on a second. 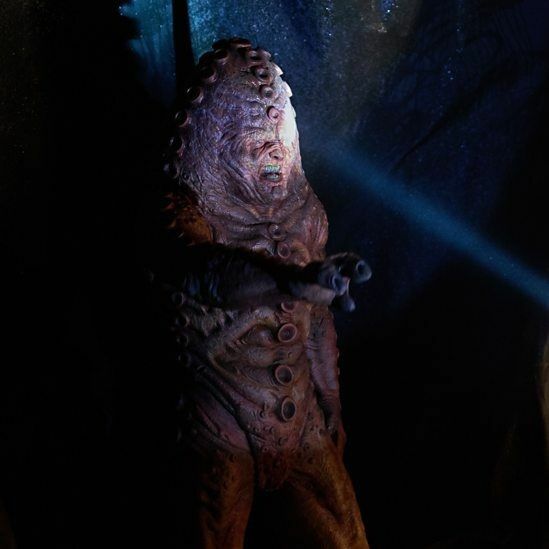 It hammers home the ability for the Zygons to absorb not only the appearance of their double, but also their memories and personality, all in the service of the greater plan. These new and improved Zygons are frankly pretty terrifying. Yet even in a story of doubles, Harness manages to leave us with several horrific deaths that are seemingly improbable to escape from, including Clara, Kate, and Jac (who I’m pretty sure is actually toast). But the Zygon Clara, who goes by the name Bonnie, is alive and with purpose, and set to take down the president’s plane, with the Doctor and Osgood on-board — a thrilling, epic visual cliffhanger. Perhaps the most moving and emotionally complex scene in the episode was the one with the soldier Hitchley (Todd Kramer, who played the material masterfully) confronted with the Zygon double of his mother, which led to not only his death, but also that of his fellow soldiers. Keeping the Zygons largely out of sight until late in the episode was an effective artistic choice. Also, props to the production team for all the gooey, icky Zygon goodness, especially the pods and the underground lair. This is the sort of stuff that “Terror of the Zygons” dreamed about! I don’t know exactly what locations were used for this story, but the production team did an exceptional job of making it feel global. Kate Stewart: “In the 70s/80s, one of our staff was a naval surgeon, worked at Porton Down. Captured Zygons. Developed Z-67. It’s a nerve gas. Unravels their DNA — basically turns them inside out.” This is an enormously clever shout-out to the past, turned into plot for the present. It not only addresses the UNIT dating controversy, but it also hearkens back to companion Harry Sullivan (the naval surgeon), whose final story as a traveling companion was “Terror of the Zygons,” and the Porton Down reference is a line the Brigadier had in “Mawdryn Undead” about Sullivan. That was a lot to cram into a couple lines. I bow to you, Peter Harness. It’s difficult to imagine that nerve gas not playing a role next week. Having been quite certain over the past two weeks that Ashildr/Lady Me is the prophesied hybrid warrior, now I am forced to second guess myself. Here the Doctor suspects that it may be Osgood. It’s probably neither of them!